I developed The Art Alternative in an effort to provide instruction to "at risk" preschool age children. The instruction focused on academic subjects such as math, language arts, science, geography and history through the use of art. In cooperation with The King Center, a non-profit organization, I wrote a proposal which resulted in grants from three sources: two local non-profit organizations, The Tallman Trust and Zonta, and one state agency, The Illinois Arts Council. After 9 weeks of instruction, the children who participated in the program not only learned the various academic skills, and produced beautiful works of art, BUT also developed self-esteem, listening and verbal skills, and greatly improved their fine motor skills. For all these reasons, the program was a resounding success! 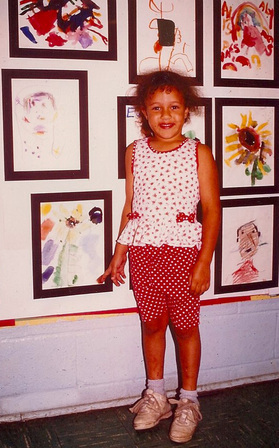 This is a picture of Shayla, a very proud participant at The Art Alternative Exhibit. Deshan, proudlly exhibiting his painting. Close up of "Birds", a gorgeous, vibrant, watercolor by 4 year old, Deshan. This is a close-up of Shayla's painting. This was a science lesson, in which the children learned about flower parts, pollination, etc. 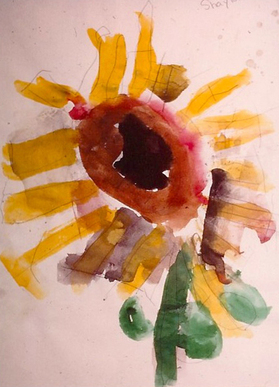 The art lesson was to paint a flower. Mary Jo at the Art Alternative Exhibit standing next to her painting of the flower she chose to paint.